Kris Schaffer, of Sinking Spring, Pennsylvania, shows off a healthy black drum. 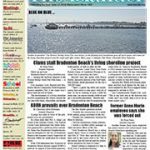 It was caught Feb. 6 using a sand flea for bait. She was guided to the fish by Capt. David White of Anna Maria Charters. With the outlook ahead of some of the most beautiful weather anywhere, anglers are eager to get on the water. Fishing inshore around Anna Maria Island is producing decent numbers of sheepshead. Whether fishing around docks, piers, bridges or reefs and wrecks, sheepshead are the most abundant species. Using live shrimp as bait will suffice in most scenarios. If you find the sheepies to be finicky, try baiting with fiddler crabs or sand fleas and see if they work. If the sheepies are not hungry, you’ll have to resort to digging for tube worms, which even the most stubborn sheepshead will take. But trust me, you’ll earn every worm you have, as they are labor intensive and hard to find. 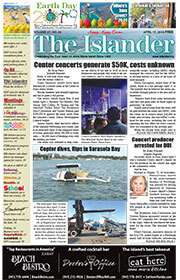 Redfish are another species being caught frequently around Anna Maria Island. 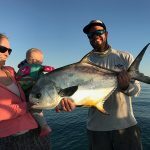 Although they are catch-and-release until further notice from the Florida Fish and Wildlife Conservation Commission, they provide great action for sport fishers in cooler months. Casting live shrimp in canals and around docks will attract these resilient fish to the hook. And, while you’re targeting reds, there’s a good chance you’ll encounter other species, such as black drum, flounder and sheepshead, for the cooler. On my own Southernaire charters, I’m concentrating on catching sheepshead. These fish put up a good fight and they are excellent on a dinner plate. Most sheepies I’m catching are being taken from reefs and wrecks. I’m also catching some around residential docks when targeting catch-and-release redfish. Live shrimp seem to work fine as bait on days when the sheepies are in a feeding mode. On days when they seem to be on siesta, a fiddler crab can entice them to the hook. Dock fishing for catch-and-release redfish is producing some alternate action for my clients. Some mornings yield as many as a couple of dozen reds. Lastly, venturing into the Gulf of Mexico is providing action on snapper and grunts. Live shrimp on a knocker rig in depths of 30-40 feet is yielding Key West grunts, mangrove snapper and lane snapper. Tripletail are being caught around floating debris in the same area. Jim Malfese says sheepshead are the highlight at the Rod & Reel Pier. Pier fishers casting live shrimp under the pier deck are being rewarded with sheepshead, as well as an occasional flounder or black drum. Bouncing pompano jigs out from the pier also has rewards. You might also hook into jack crevalle, ladyfish and maybe even mackerel, but don’t forget to tip that jig with a piece of fresh-cut shrimp. Capt. Aaron Lowman is working inshore for a variety of species. Casting soft plastics combined with a jig head is attracting spotted seatrout to his anglers. To find the fish, Lowman is drifting over deep grass flats, where sandy potholes are dispersed throughout the shallow waters. While targeting trout, Lowman also is hooking into an occasional pompano. Moving into the Gulf of Mexico, Lowman is taking charters to fish the ledges for snapper, grouper and sheepshead, where live shrimp as bait is working well. Capt. 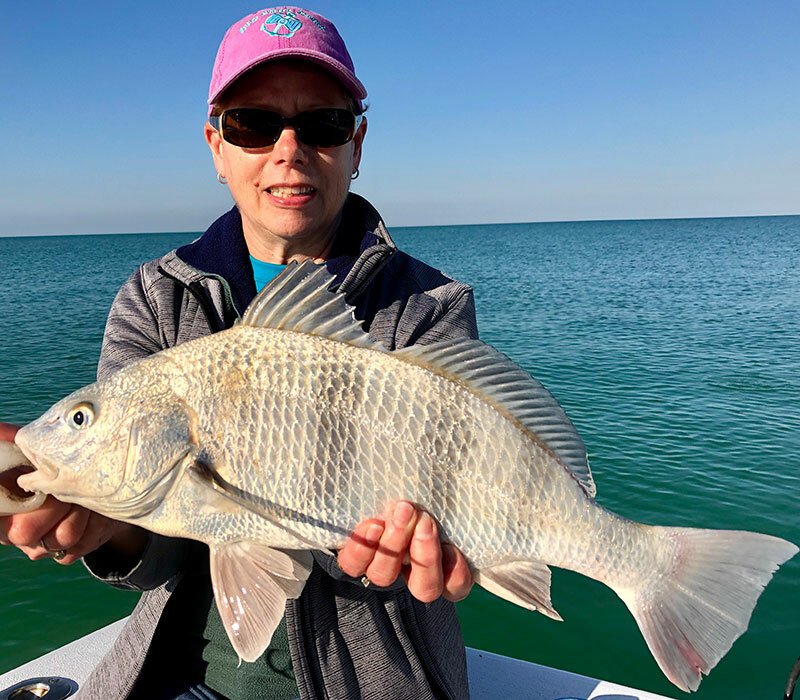 Warren Girle is fishing nearshore ledges, reefs and other structure in the Gulf of Mexico, where using live shrimp as bait on a knocker rig is yielding a variety of fish, including mangrove snapper, Key West grunts, sheepshead and flounder. Moving inshore, shrimp remains the perfect bait — around docks and seawalls, where it is producing sheepshead, black drum and catch-and-release redfish. Capt. David White of Anna Maria Charters is cashing in on near-perfect weather by venturing offshore with charters in search of big fish. Fishing hard bottom and ledges is producing some hefty red grouper, as well as mangrove snapper and hogfish. Also, offshore around the wrecks, are numerous amberjack, which are nice when a client is looking to get worn out from a fish. Moving inshore, White is targeting the popular winter trio, sheepshead, black drum and catch-and-release redfish. While patrolling inshore, White also is finding good numbers of pompano. Capt. Jason Stock is doing well on amberjack now that the winds are lighter and the seas are calm. Both live bait and artificials are working to lure these “reef donkeys” to the hook. His clients are getting a thrill and a workout from the amberjacks — known for drag-screaming runs and a fight to the end. While offshore, Stock also is putting anglers on hogfish, mangrove snapper and red grouper.